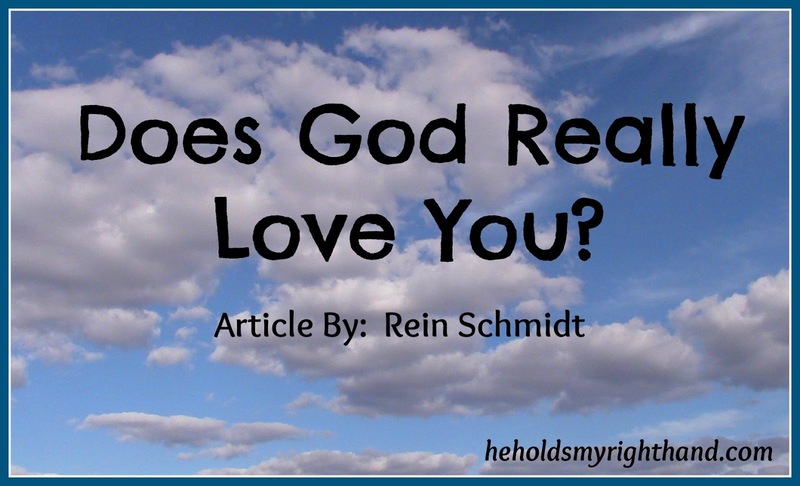 He Holds My Right Hand: GUEST Rein Schmidt: Does God Really Love You? I am sharing an article from a friend of ours, Rein Schmidt. He writes an e-zine of theological "Ramblings," and this particular one from September 29, 2015, can be helpful to all who are going through a dark valley. Rein says, "It seems like the more we desire to serve the Lord, the more obstacles Satan puts in our paths. Sometimes, it just becomes too much to bear. So here are a few things the Lord reminded me to think about. I know there are many ways the Lord can use to keep us encouraged, and I listed only a few of them. I would love to hear how the Lord has worked in your life regarding this topic that I rambled about." If you would like to share a thought with Rein, please make a comment below, or contact him at THIS E-MAIL ADDRESS. You can use the same e-mail to sign up for his "Ramblings." Thanks for allowing me to share this, Rein! Your suffering is a great enticement to Satan. He and his anti-God federation are irresistibly attracted to persistent suffering and pain. Notice how he obsesses over Job’s misery. Notice how he shows up in the wilderness at the height of Jesus’s weakness (Matthew 4:1–11). Satan is savvy enough to know that his lies are less effective during prosperity, so he waits until life is hard and we are more vulnerable (though he has plenty of weapons for our good times as well). Then, when he suggests that God does not love us, he suddenly sounds compelling. In other words, we need all our wits about us when suffering comes our way. Does God love me? Am I suffering because I have done something to incur his displeasure? These can drift into questions about God himself. Is he good? Does he hear? Does he care? Over the past several months there have been times when I have asked the same questions. Does God love me? Am I suffering because I have done something to incur his displeasure? Does he hear my prayers? Does he really care? Satan has a unique way of bringing discouragement into life and before long discouragement produces disillusionment which produces doubt. Once doubt enters your mind you find yourself asking the questions I mentioned above. As you seek answers to those questions, depression settles in and the answers to those questions seem even farther away. At this point there are a few things to remember. In the Old Testament era, there may have been good reason to believe that God was either letting us go or chastising us in our suffering. Everything changes, however, when Jesus comes as the suffering servant, lives in poverty, is rejected by his closest friends, absorbs shame, submits to a gruesome death, and inaugurates the new covenant with God’s people. In this, he is celebrated as the image of God (2 Corinthians 4:4, Colossians 1:15), the one who is fully God and fully human, our perfect representative and our King. This creates a new story for us. Jesus, who is clearly loved by the Father, goes through the worst of suffering. As believers, we have been united with the Son, so we expect to know both suffering and love. As Jesus goes, so go his people. If the King was not spared the hardships of this present world, we should not expect to be spared. This is why the apostle Paul boasted about his suffering. Those sufferings showed his connection to Jesus and to the Father’s favor (2 Corinthians 11:24-30). Look more closely at Jesus’s temptation in the wilderness (Matthew 4:1–11). God’s children have always been refined through testing. Even before Adam sinned, he was tested. This is what royal children expect. If we are to ascend to co-regency, our allegiances will be tested too. But as we are led into our wilderness, our suffering, we are not alone. We have the Holy Spirit to help us, and with his help we can grow in maturity and wise judgment. Two things are important here. One is that we can take joy in being tested (James 1:2). It is evidence that we are beloved children who have been found worthy. The other is that we want to grow in the testing, which means that we aim to trust him, believe him, and seek him in our suffering, rather than turn from him. New covenant love takes on new features. Our Father’s love is now revealed as more developed, “sophisticated,” in a sense. In fact, it is beyond our understanding. All we have to know is this: He displayed irrefutable love when he died for enemies, and his ongoing love includes reworking us into the shape of Jesus, which is the greatest of all gifts (Romans 8:28–29). To paraphrase the apostle Paul, this means God will certainly not abandon us now. He will not even get a little stingy with his love. His love is relentless, sacrificial, and generous. The cross of Christ is the evidence. So we trust him, as a young child trusts a good parent (Psalm 131:1–3). These realities of God’s love are, of course, spiritual, which makes them difficult to see. To complicate that chronic challenge, suffering can impair our vision even more. It can dominate our perspective and become the only perspective. So our questions keep haunting us. Does God love me? Does he hear? Does he care? To combat these questions, we acknowledge our need to see by faith (2 Corinthians 5:7). This is when we call out for help from the body of Christ. Spiritual battles should not be fought without the aid of other people who can join us in prayer, encourage us with their presence, and offer apt words of truth from God’s Word. We could ask them to pray for us as Elisha prayed for his servant. When surrounded by an army that was sworn to kill the two men, Elisha prayed that his servant would see by faith. “O Lord, please open his eyes that he may see” (2 Kings 6:17). Then we keep our faith eyes peeled. We look back and see the pinnacle of love in the person of Jesus. We also look ahead and see that suffering will end someday, and the one we desire to hear with our ears and touch with our hands will be fully present with us. But for now, with our eyes wide open, we walk with him, in suffering, today and believe that he will give us grace again for tomorrow (Matthew 6:33–34). Where mere human sight sees only darkness, faith sees that we partner with Christ in his agenda to show his power in our weakness. 5. Here Is a Better Question: Do I Love Jesus? In keeping with God’s surprising ways, one other response to suffering’s questions is to ask a new question , one Jesus posed to the apostle Peter. Peter had witnessed the life and resurrection of Jesus, so he had no doubt that he was loved. But he was still weighed down by his betrayals and assumed that he had relinquished his usefulness. In response, Jesus asked a question. He asked Peter, “Do you love me?” (John 21:15–17). Perfect, isn’t it? We could be passive until now, as if waiting for enlightenment to strike. Now there can be no passivity. Our answer will not change his love (2 Timothy 2:13), but it might suggest that the problem lies within us, rather than in God. At the very least, this surprising question gives us another way to pray and ask for prayer. We want to know the expanse of the love of God and love him in return. Suffering does interrogate our souls. But we have the means to wage the spiritual battle. We identify ourselves as united with the suffering servant, we see God’s purpose in testing, we trust him, we walk by faith, and we test ourselves by asking about our love for him. Taken together, these spiritual disciplines can overcome our lingering questions about God’s love and send us in the direction of peace and even joy. God has love the believer before the foundation of the world. Yes God loves us.